It didn’t look good. Two books arrived for review, both written by TV journalists and both punning on the phrase “Breaking News" in their titles, which did not augur well for a weekend’s concentrated reading. Steeling myself for diatribes on the state of the media and its will to break news with the propensity of a flatulent aunt, I found myself surprised. Neither book was an introspective look at the state of TV journalism, at least not directly. One was an account for a Bharat darshan kind of trip made to cover the 2009 election and the other a work of fiction set in a news channel. Braking News by Sunetra Choudhury tells the story of the NDTV election special, where two girls boarded a bus and travelled 15,000km, “trundling through", as the blurb puts it, “the bylanes and boondocks of Bharat, in search of the elusive Indian voter and an insight into his mind". The result is a highly readable book that takes us on a somewhat inconsequential journey through the Indian heartland. Of course, those looking for insight into the nature of the Indian polity, or even explanations about how the United Progressive Alliance (UPA) won such an unexpected victory, will be disappointed. There is little here that is valuable by way of political analysis, and indeed, the very idea that any deep meaningful understanding could emerge from an exercise like this is by itself flawed. The strain of travelling every day makes the reportage very thin, and in most cases the reporters make do with what they can cobble up. Choudhury is hardly a political pundit, nor does she, for the most part, pose as one. And that, far from taking away from the book, is in fact its charm. The author takes us through her journey from her own very personal vantage point and does so with an honesty that is disarming. She admits to her own anxieties and insecurities and allows us to care for her as a character in her own book. It also allows us to interact with the people she meets and describes in human terms, rather than as objects under analytical scrutiny. The best parts of the book are those where Choudhury and her colleague Naghma Sahar get to meet ordinary Indians and connect with them in simple and sometimes moving ways. The stories of people like the English speaking 11-year-old Dalit, Hitendra, who is proud of Mayawati and wants to be a doctor, or the strangely joyous village of Shivgarh, which finds a way of coping with the lack of electricity with innovative equanimity, or Narayanan, the local journalist of Kadapa in Andhra Pradesh, who doesn’t eat at the house of a politician so that he doesn’t have to think twice about criticizing him, are all told with a sense of naivete, which serves to create a sense of warmth and intimacy. In addition, the story of the trip by itself makes for interesting reading. The cast of characters on the bus are dwelt on sufficiently to make us feel that we know them. The occasional attempts to extrapolate political understanding from their observations are the weaker parts, like the bit where actor and politician Raj Babbar is interviewed and somewhat sweeping conclusions drawn about his irrelevance on the basis of offhand interactions with some voters. 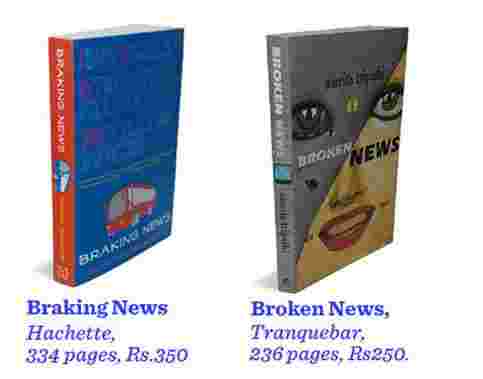 If Braking News is an innocent, almost wide-eyed look at the world of news, Broken News by Amrita Tripathi is its exact opposite. Set in an English news channel, this is a world where everyone has been there, done that and done everyone else on the same floor just to be sure. The protagonist M (we find out at the end that her name is Meera, but for some reason this is a big secret) is a paranoid journalist who is slowly but surely losing control of her life. The book takes us through this journey, punctuating it with the usual—meltdowns, cigarette breaks, expletives, abortions and a suicide. It is difficult to care for any of the intensely self-absorbed people in this book, of whom a regrettably small number die. The atmosphere conjured seems authentic and serves to present the worst advertisement possible for a career in TV journalism. There are few redeeming features in M’s world and the same holds true for the book. The writing is predictable and the events that unfold even more so. Broken News is an opportunity wasted; someone with an insider’s perspective could have gone just a wee bit deeper or at the very least been more gossipy. As it turns out, Broken News lives up to its name. Santosh Desai is CEO, Future Brands and author of . Mother Pious Lady.